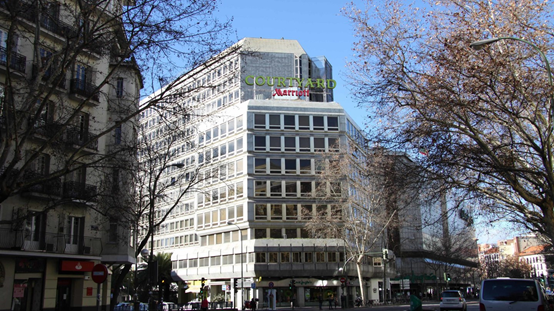 Marriott Madrid is located in the west of Madrid, the core of the international entertainment zone. You can quickly find such famous shops as Zara and Mango, and enjoy delicious food in famous coffee shops and restaurants. Visitors can easily visit major urban attractions such as Madrid Palace, Opera House and Madrid Cathedral. The hotel has 423 rooms with comfortable and distinguished rooms. Among them, the exquisite suite area is 22 square meters, bright and spacious, with living area, desk, flat-screen TV, Mini bar, marble bathroom and so on. Eight multi-functional halls have an area of 1500 square meters, natural lighting, complete equipment, to meet the social and business needs of various customers. In addition, the hotel also has fitness centers, indoor swimming pools, parking, bars, restaurants and garden terraces and other facilities.